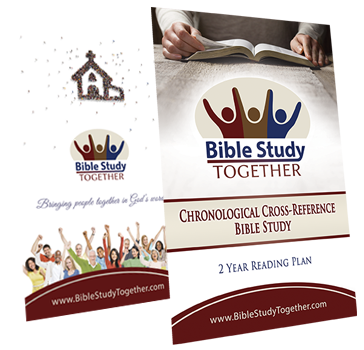 Order your own printed copy of the 2 Year Chronological Cross-Reference Bible Study Plan. It has a tough card-stock cover and the whole booklet (including the inside pages) are glossy coated to protect it while you use it for the next 2 years. Before you order, please take some time to learn more about Bible Study Together and what we hope to accomplish in the near future. The printed version of the plan lets you keep reading when you are away from the internet and enables you to use your favorite Bible. Our goal is to get people reading the Bible in their communities and abroad. We believe reading the Scriptures with others presents one of the best opportunities to encourage Christians in the faith and help friends find Jesus. Bible Study Together is committed to creating a new Bible reading experience for those who have gotten burned out in the past and to help all believers maintain consistency in their walk with God. Those who financially support Bible Study Together are helping to empower people to read the whole Bible. We go into churches and communities getting the word out about our resources and inspiring people to read their Bible with others. Over the next year, we hope to start up local Bible studies in churches, prisons, college campuses, nursing homes, and the military. In addition, we plan to further develop our online resources by adding study content to the daily reading. 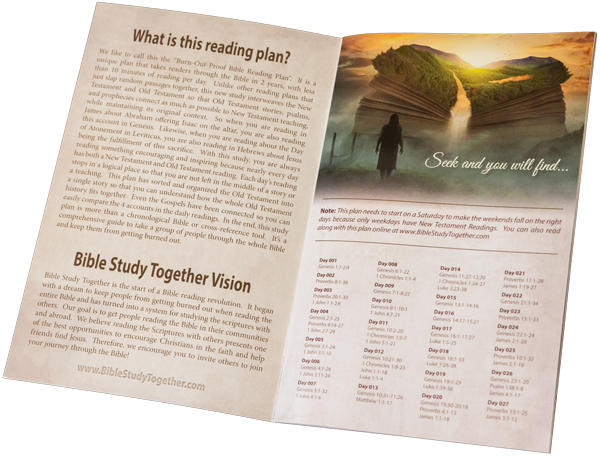 You can look forward to life application study questions, inspiring videos, social media connections, Bible study builder tools, mobile apps, and more printed content to go along with our reading plan. Bible Study Together is a ministry of Create Disciples Inc. which is a 501c3 non-profit organization and so we can provide you with tax write-offs. If you believe that people need to read and know the word of God, then consider partnering with us because we are converting money into more people reading the Bible (Support this work). Bible Study Together is managed by Peter Schrock. Peter is a member of Parkland Chapel Church in Farmington, MO, married to Melissa Schrock, and has two daughters. He is the author of Finding Life – A Journey Through 1 John, the founder of www.GodlyChristianMusic.com, worked six years with children in residential care, a devout student of biblical Greek, a disciple of Jesus Christ, a creative developer, and the owner of Finest Studios. We have made our reading plan available to you at our cost to print, process CC fees, and ship. However, we are also giving you the opportunity to help support what we are doing by adding an additional gift to your order (which you can write-off on your taxes). It is our goal to get people reading the Bible without hindrance, so we don’t require you to give anything extra if you don’t feel compelled. If you are a church or leading a Bible study and would like to order over 30 copies please contact us directly. Important: Bible Study Together is a ministry of Create Disciples Inc (which is an approved 501c3). Therefore, your order will show that it is from Create Disciples Inc and you can reference this organization for your tax deductions. Booklets only ship to USA and Canada. Our Study Journal is available internationally.